Keeping It Simple: refocusing and prioritizing. Would you agree that 'Keeping it simple' encourages creativity? I find it gives me reason to create a simplicity filter that keeps noise and chaos at arm's length. However, by consciously thinking about 'simplicity,' I'm better able to recognize it and appreciate it, and closer to delivering it consistently to those around me. I hope this month's blog highlights will inspire you to keep it simple and help you refocus and prioritize. Heading to INBOUND 2012 in Boston where I'll connect with brilliant friends and marketers such as Ann Handley from MarketingProfs, Peter Kim from Dachis Group, Gary Vaynerchuk from Crush It!, David Meerman Scott, author of The New Rules of Marketing and PR, and others. Please connect with me if you're headed there, too! I'm at the early stages of planning for Surfaces 2013! I'm particularly excited about moderating a retailer panel discussion to explore how each is using digital and social media marketing to generate leads, connect with customers, and promote business. If you have interesting examples to share, please let me know. I plan on writing about the common themes and would love to include your experiences. How are you keeping it simple and focusing on priorities? How do you keep noise and distractions at bay so you can deal with what really matters? Let me know. A special thank you to Tim Girvin, who in response to last month's newsletter on creativity shared an article he wrote about the creative meditation. Titled "What I have Learned in One Day," it is visually inspiring and soothing to the soul, and perfect in anticipation of a Labor Day weekend holiday. I think you will enjoy it immensely! 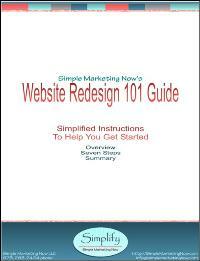 If you're about to launch into a website redesign, consider downloading this 18 page eBook which details 7 questions to ask before getting started on a redesign. You received this email because you are subscribed to Monthly eNewsletter from Simple Marketing Now LLC. If you prefer not to receive emails from Simple Marketing Now LLC you may unsubscribe or set your email preferences.